The Ocean View Villa Suites feature full-time time butlers, designer kitchens, and optional private plunge pools. 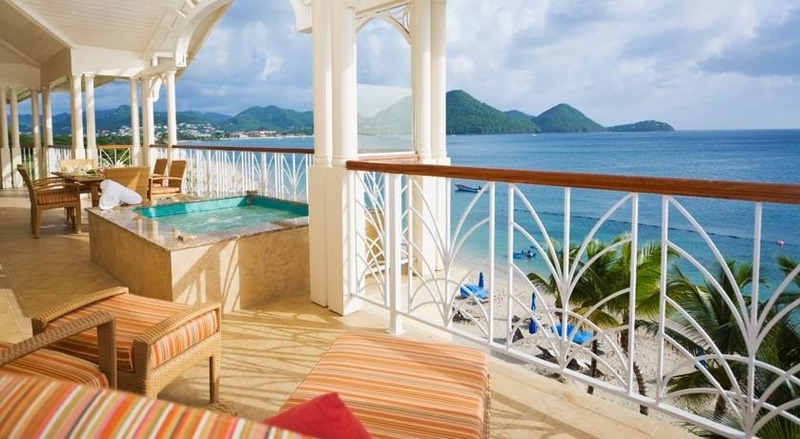 The Landings Resort and Spa is located on the beach in St. Lucia and offers tropical gardens, three swimming pools, two hot tubs and a luxury spa. Each stylish, air-conditioned villa has a fully equipped kitchen and free Wi-Fi. The resort has an optional all-inclusive plan, which includes all meals, beach snacks and beverage service (there are some liquor exclusions). The Landings offers over 80 villas, with one, two or three bedrooms. Villas at The Landings feature elegant décor which blends European and Caribbean design. Each one offers wonderful sea or garden views, as well as a living area with an LCD TV and CD player. Some villas have private plunge pools. The Landings restaurant and beach club serve international food all day, while the seafood restaurant is open for dinner. Personalized grocery delivery is also available. A gym, tennis courts and a shop stocking beach accessories can be found at The Landings. The resort also has a kid’s club and offers regular evening entertainment. Complimentary non-motorized water sports like kayaking and stand-up paddle boarding are included. Fly into Hewanorra International Airport (UVF), St. Lucia. The resort is located about 90 minutes from the airport. Transportation can be arranged for a surcharge. Visit The Landings’ website for more information.